I have been really glad to have Megan here this week. 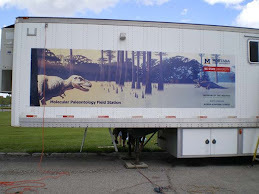 She has been a true partner in this effort for a while now, and I am glad that she can see the other end, what is involved in getting the bones out of the ground so I can dissolve them….she has proven to all that she is every bit as diligent and hardworking in the quarry as the lab. She is also an excellent teacher, and students and colleagues alike have watched her to learn the methods we apply so that they can repeat our experiments, either with samples of our bone, or with bone in their local regions. I can’t wait for these results! 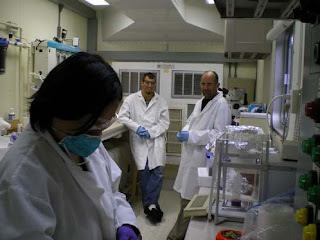 She is more at home in the lab, showing Ben and Clive what they need to do to repeat our work. 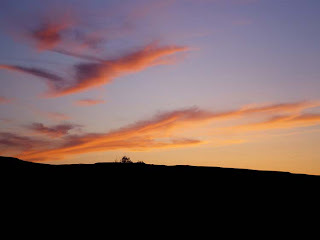 Three days ago, we were treated to a spectacular sunset. 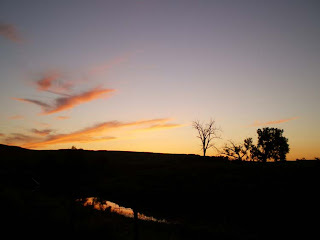 I love the sunsets here, the sky is so big, and I think that, just like with human art, the bigger the canvas the more can go into the painting…little did I know that this gentle, beautiful sunset would presage a night-long gale. I woke up to a tent wall smashing into my face, practically smothering me. I spent several hours trying to sleep while one arm kept the tent at bay. It didn’t work. 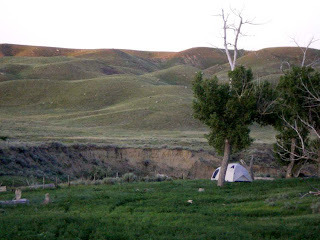 When I woke the next morning….or rather gave up the fight and just got up….my tent was very lopsided. I was exhausted, but we planned another prospecting day and I didn’t want to miss anything, so even though the wind still howled we were off to explore the lands belonging to our private donor. 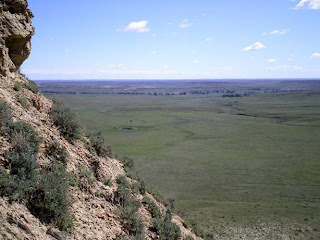 We split into two teams, with Paul, Toni, Jim, Alex and Eric exploring the far side of the badlands, and Liz, Clive, Megan Tim and I hitting those bluffs closer to town. I have never been out in the badlands when the wind has blown so strong, so consistently. Best form of art ever! But, unfortunately my tent did not fare so well in the wind. It is new, and a good one, but one of the anchor straps ripped out of the tent bottom. I will hold my breath and hope that there is no more huge winds until I can get it repaired. Did I mention product testing in the field? If a tent can make a season out here, it is a well made tent indeed. Maybe these companies are afraid to let us test their wares under field conditions????? Thus ends our first full week out here. I thought I would end with a shot or two of the visitors to our camp. There are rabbits everywhere, and they are not shy at all. They hang out close to the camp—waiting for food I suppose. 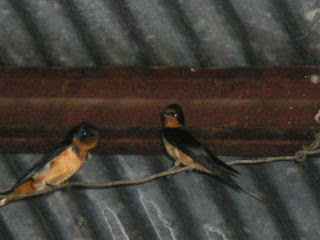 And, what makes this a very ‘plush’ camp, the metal Quonset hut where we are allowed to store food and gear and get out of the sun, wind, snow, and rain, is also home to many barn swallows. 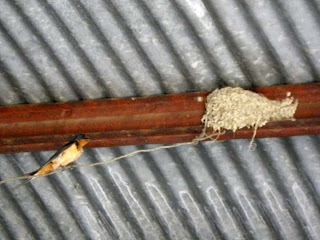 They build their nests in the rafters, and dart in and out during dinner. They are fun to watch—and they seem to equally enjoy watching us! 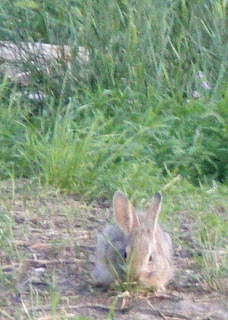 Bunny friend… they multiply like…well…Like rabbits I guess. I think this is a mom, with young in the nest, because she sure is nervous…but it is too high for me to see for sure. The nests are a true engineering marvel. Well, tomorrow may be another quarry day, or it may be a lab day. I have a lot to do that requires a computer, but I hate to make the students do the hot hard work unless I can help as well. We will see what the morning brings, I guess. One thing about being here, it will be fun, beautiful and relaxing. I can feel the stress melt away. And we have another week yet, with another quarry to open (hopefully) and more experiments to do, as well as new recruits (fresh blood).